Presented here, is a fabulous, 19th century Native American Basket Wall Pocket in original blue and red paint. It is soooooo sweet and oh, so RARE! The paint is real and right and it is in fine condition. I love these little wall box baskets and rarely have I ever had them in color, let alone in blue. It measures 16 inches high and 9 1/2 across. 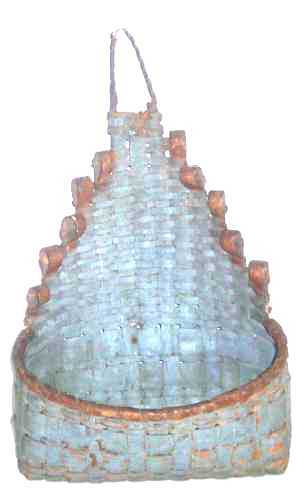 The body of the basket is blue and the wrapping around the outside and rim is red. They simply don't get any better than this!